Venn diagrams are illustrations that show the possible logical relationships between sets of objects. They are made up of two or more partially overlapping ellipses. 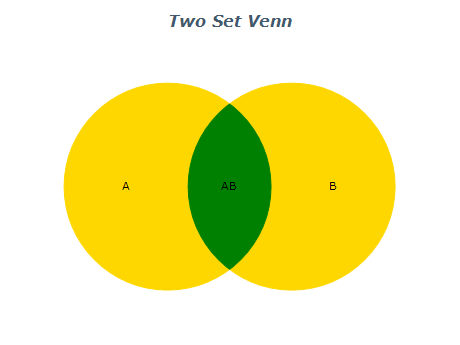 The following figure displays a Venn diagram with 2 sets. The following figure displays a Venn diagram with 3 sets. The following figure displays a Venn diagram with 4 sets. The following figure displays a Venn diagram with 5 sets.